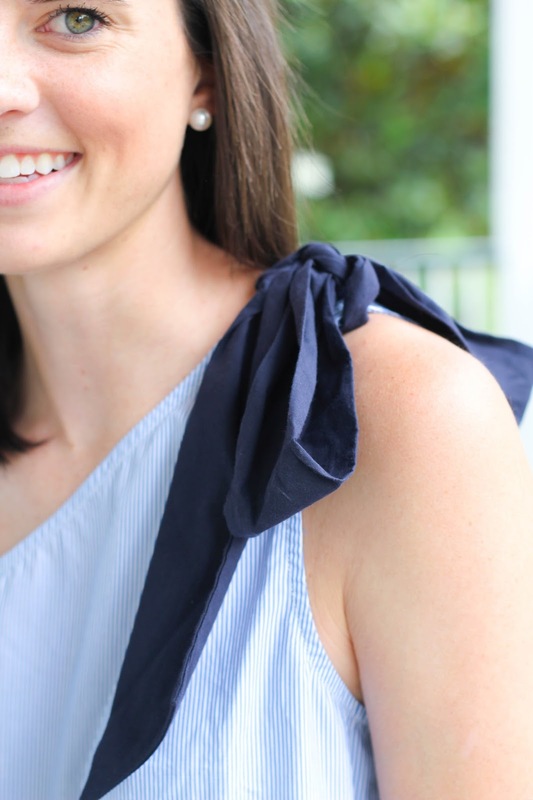 This summer seems to be one defined by cute sleeve details considering just about all of the new tops I've gotten this season have something unique to offer when it comes the their sleeves. I am pretty positive that this top is probably a distant cousin of this one that I featured earlier this season and being the nice person I am I just had to reunite the family members in my closet (lame excuse but just wait till you see the detailing on this one). All jokes aside it really is such a unique tank and it's clear that the brand paid close attention to the detail work! We all know that I love the color combination so there is no point in wasting time elaborating on that. 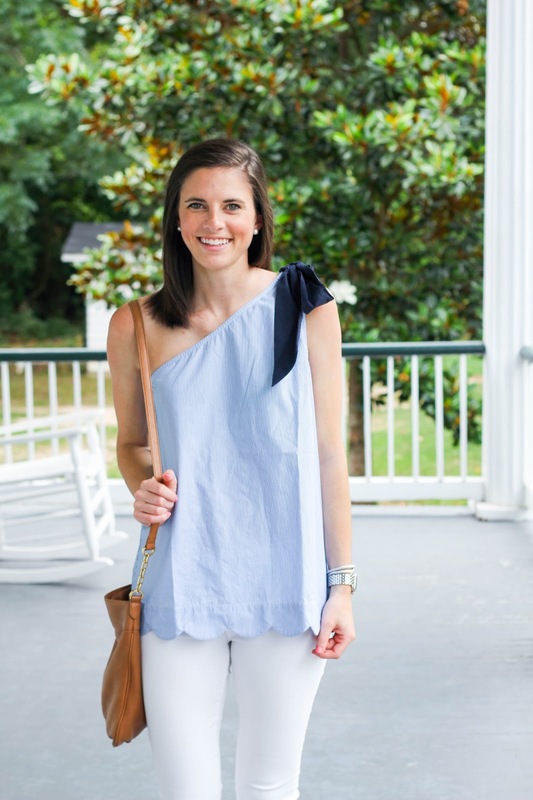 What initially drew me to this top as the one shoulder silhouette and the cute bow on the shoulder. I definitely think it would be overwhelming to have a bow like this on both shoulders but with a one shoulder top it is perfect. At this point it was already in my cart before I even noticed that the top had a cute scallop hem. WIN. The fit is loose and the material is the perfect weight to be comfortable in the summer heat however if you plan to order this I would go a size down. I ordered a small and had to exchange it for an extra small. The small wasn't falling off my frame but would have stayed in place better had it been an extra small. Since the top makes a statement on its own I figured that white jeans were the best options when it came to pants. 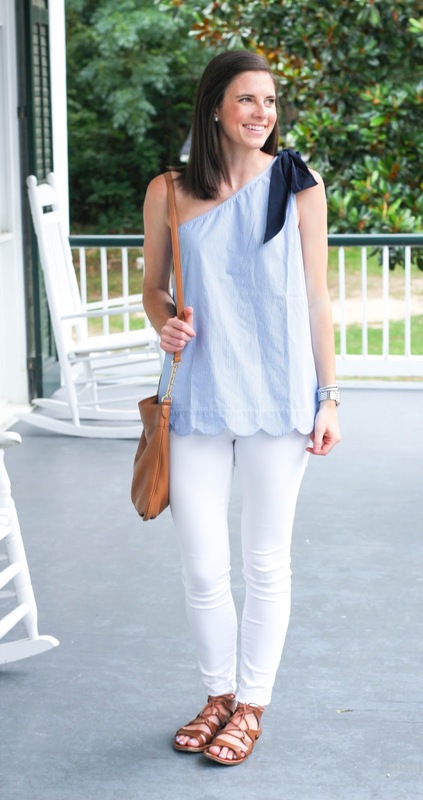 The scallop hem agains the white of the jeans makes it stand out even more although i'm sure it would look just as precious with shorts. When wearing blue and white I tend to gravitate towards a rich brown in the accessories department. 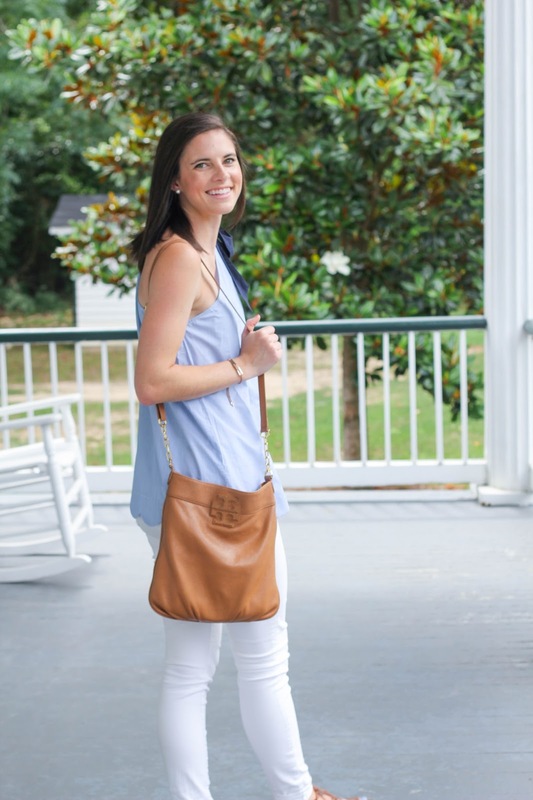 I've had this Tory Burch cross body for years (similar here) and love the way it compliments my brown sandals and the rest of the outfit. 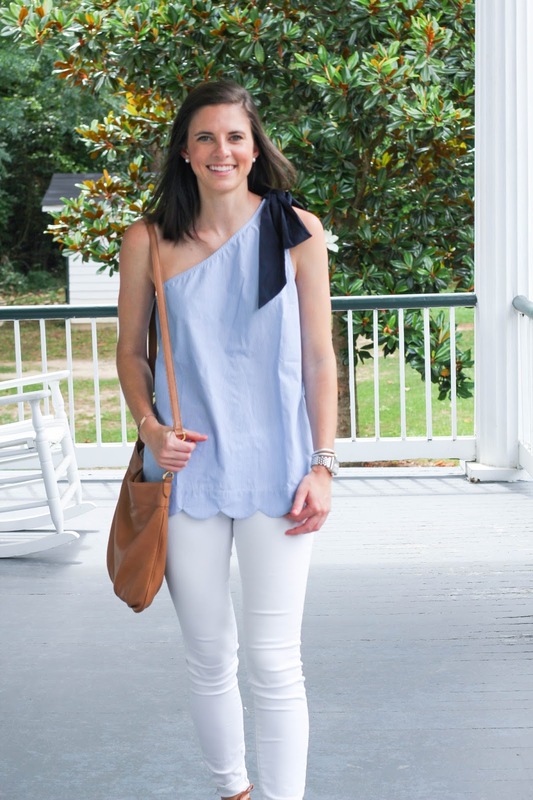 With my everyday jewelry this outfit is perfect for so many occasions but looks equally as cute paired with wedges (my recent favorites) for a more sophisticated look. I am finally getting things more situated here in Greenville when it comes to both my room and my routine. I no longer cringe when I open the closet since I was able to shove store my off season clothes under my bed and finally have things functioning in a normal way in there. I've been getting up pretty early to have time to blog and work on what I can for class before it starts and am getting back into the routine of working out at night but still going to bed sorta-early. I'm not loving my classes which I think is due in part the teachers lack of clear expectations and explanations of assignments so I am glad that this term ends at the end of July! 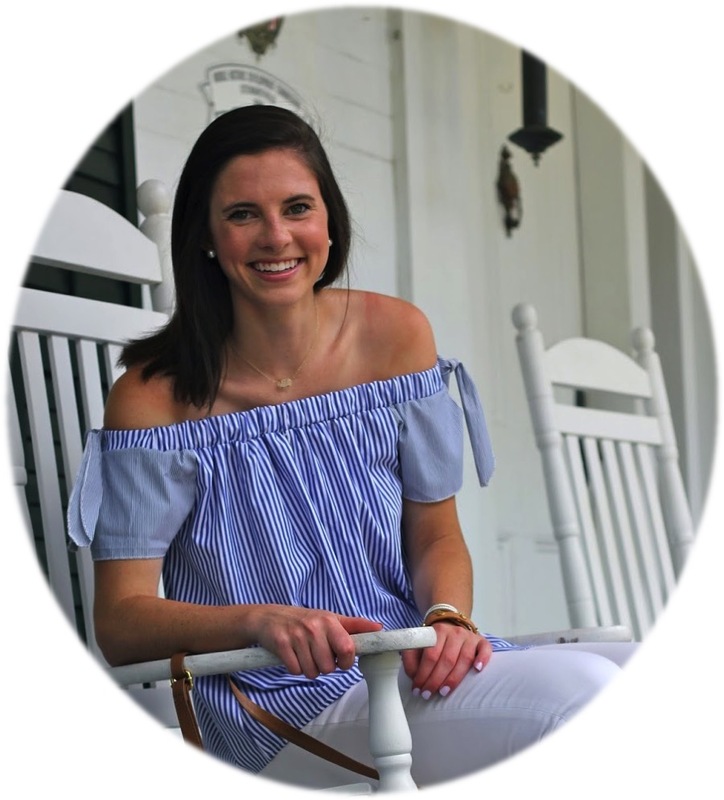 I've been trying to stay ahead with blogging and would love y'alls ideas for posts you'd like to see so if you have something in mind definitely leave it below for me! Love the colours of this outfit, but I especially love your bag! I love that the bow on the top is navy! 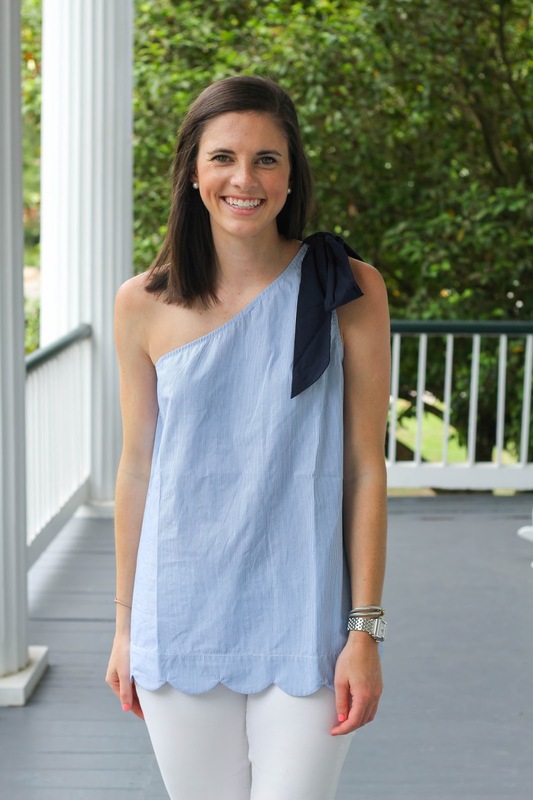 It gives an unexpected twist to the light blue and white shirts and dresses I've been seeing lately. So obsessed with this top! Seersucker, bows, and scallops, omg so cute! 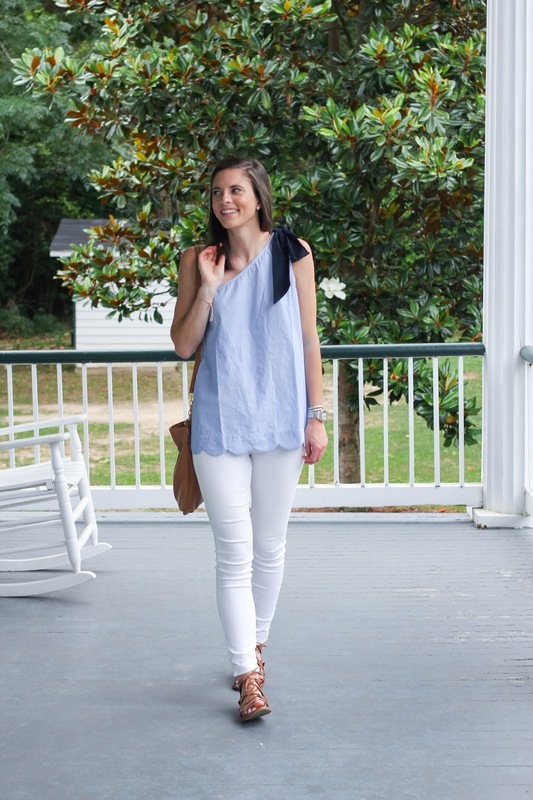 I love the scalloped detail of that shirt! Being comfortable is a must for the summer....especially in the heat! 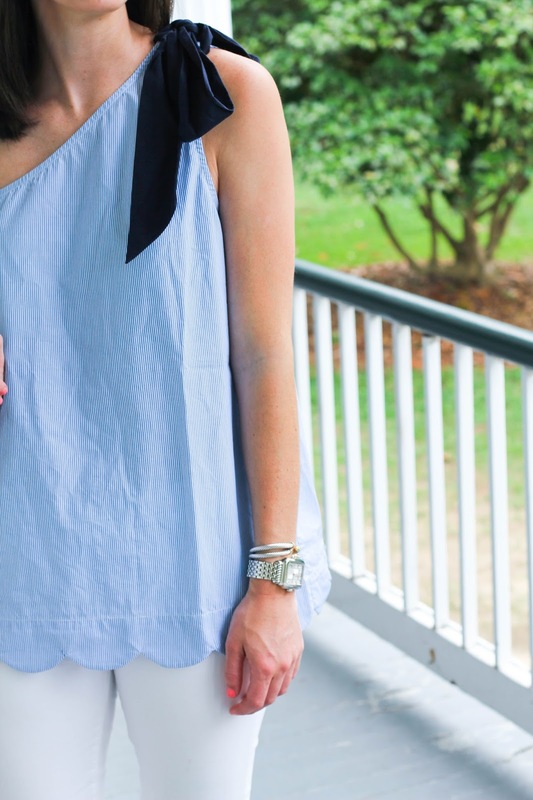 Love the scalloped hem! This outfit is so cute on you, Dorothy! 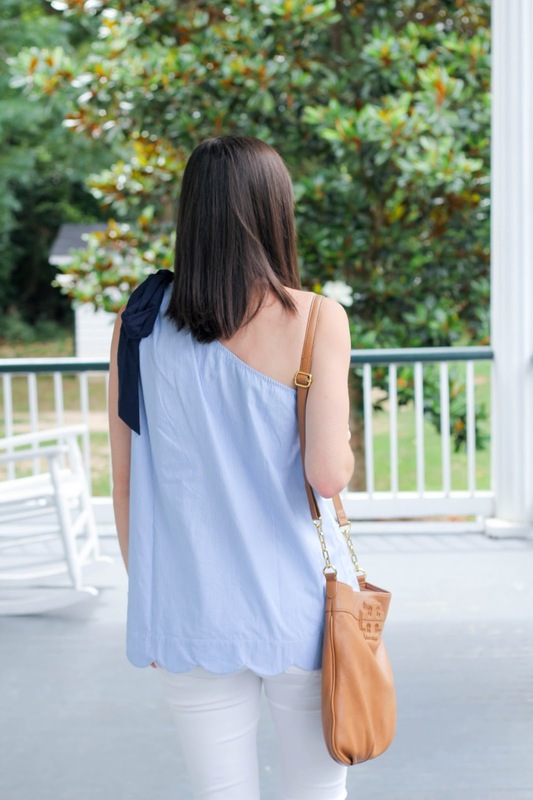 I love the navy bow and the scalloped detailing! As for blog posts, I would love to see your summer daily routine, college preparation posts, or organization posts!